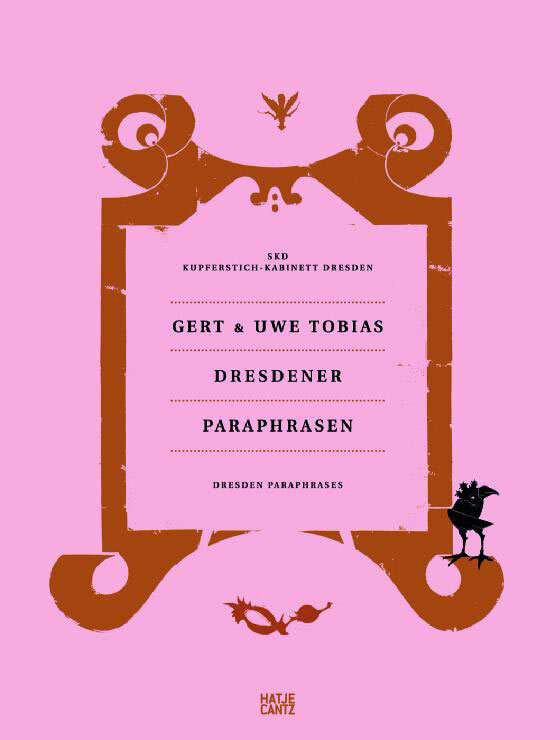 Bound in pink satin and stamped with a grand gold cartouche, Gert & Uwe Tobias: Dresdener Paraphrasen / Dresden Paraphrases might be mistaken for a reverent tribute to the frothy Rococo of Dresden’s prewar city center, were it not for the small mutant chicken, perched on a curled corner of the cartouche, missing its torso and looking a little dazed. Its presence, both cute and creepy, disrupts the formal symmetry and alters the historical implications of the design. The bird’s silly beak points firmly to the 21st century while its talons grip the 17th. 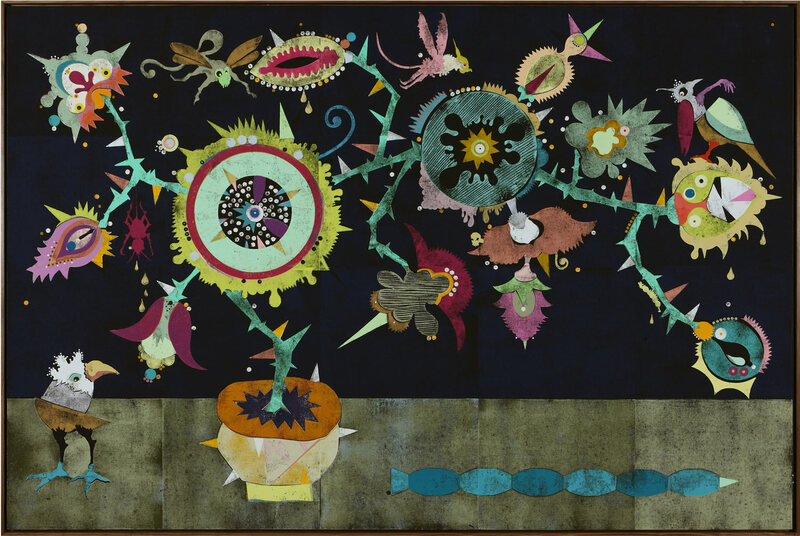 The Dresden Paraphrases are much like that mutant chicken: woodcuts, collages and typewriter drawings in which past and present collide in decorative and disorienting ways. They were created by the seemingly ubiquitous Tobias brothers in response to an invitation from the Dresden Kupferstichkabinett, one of the largest and most venerable print collections in the world. This pink-and-gold catalogue documents the results in 133 pages of large, beautifully produced reproductions and four erudite essays. It forms an essential introduction to the brothers’ work, because it is as much about what they’ve been looking at as it is about what they’ve been making. Gert and Uwe Tobias, Untitled (2012), typewriter drawing on paper. ©Gert and Uwe Tobias/VG Bildkunst, Bonn. Photo: ©Alistair Overbruck, Köln. Museums these days are under pressure to demonstrate their continuing relevance, which is too often thought to be the same thing as popularity. For historical print collections this can be particularly daunting as most of their holdings lack the popular hooks of color, dramatic scale, headline-generating price tags or dramatic physical presence. The glamour associated with contemporary art does not easily rub off on old, small, works on paper. 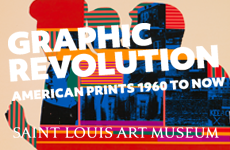 The work of the Tobias brothers would seem to offer a neat answer: among other things, they make two-meter high woodcuts that are colorful and expensive. Printed on canvas, the woodcuts function much like paintings, but with their hand-carved hard-edged forms, tiled repetitions and reusable parts, they retain the look and strategies of prints. Furthermore, they are themselves the progeny of a wide variety of printed matter that the Tobiases have assimilated much as one culture assimilates another: merging some principles, chucking out others, latching onto the odd useful word and employing it promiscuously. 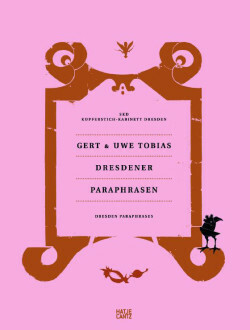 Much has been made (not least by the twins themselves) of the fact that Gert and Uwe Tobias were born in Transylvania. They have borrowed design conceits and motifs from travel posters, folkloric embroidery patterns, Dracula movies and other vehicles of Carpathian clichés. Their breakout exhibition in 2004 was titled “Come and See Before the Tourist Will Do: The Mystery of Transylvania.” Their work has often been seen as a kind of intra-European Primitivism,exploiting an insider’s “other” that conveniently bypasses the problems of postcolonial ethics. But Primitivism has usually been motivated by a desire to locate something “authentic” in that other, while the Tobias brothers seem entirely aware of the ersatz nature of their sources. Further, as Michael Hering, the Kupferstichkabinett curator responsible for the Paraphrases project, points out, local Transylvanian allusions are just one entry in their roster of influences: they make collages that echo Max Ernst and dynamic abstract and typographic compositions that evoke mid-century middle-European graphic design, a utopian discipline that aimed to transcend the local and ethnic and establish a universal visual language. Josef Friedrich Leopold, Phantastische Jagdgesellschaft (Fantastical Hunting Party) (c. 1710/1720), from the volume Inventions chinoises VI, sheet 5, hand-colored etching, 30 x 18.9 cm. Collection Kupferstich-Kabinett, Dresden. The Kupferstichkabinett uses the Paraphrases catalogue as the occasion (all too rare in a curator’s life) to lure the public into esoteric corners of the collection. Each of the four groups is treated to an extended essay that both links to the Tobias creations and elucidates the earlier works in their own right. Though the structure of the catalogue aligns each Tobias work with a specific historical group, the reality is more chaotic. 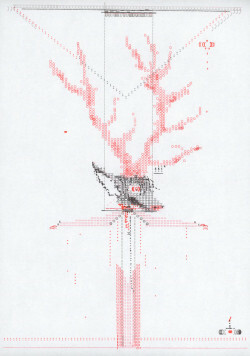 A blood-dripping, six-legged spider-bug from the chinoiseries appears in a typewriter drawing discussed in the context of the playing cards, as do three woodcuts whose dominant elements are film titles. Such fluidity between eras, techniques and ostensible purposes is part of the point, and the teasing out of connections becomes something like a sport. Meanwhile, the historical backgrounds of the earlier works complicate and enrich the new images in satisfying ways. If the English translations are not exactly elegant, the information is intriguing enough to prompt the reader to stop, flip pages and look carefully. 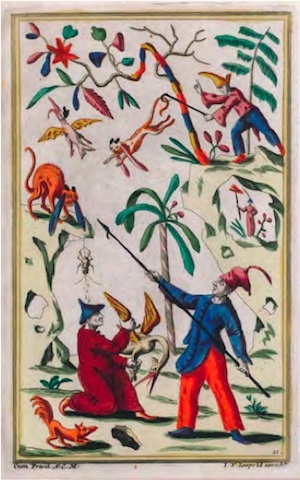 The playing cards, which are among the oldest in the world, are fascinating for what they reveal about the beginnings of engraving and for the way they embody the simultaneous delight and disquiet that cards—also known as “the devil’s prayerbook”—caused in late medieval Europe. The maker of one deck hedged his moral bets by including a final warning card that shows death grabbing a naked girl by the ankle. Made long before the dreary standardization of clubs, hearts, diamonds and spades, these decks used suits of deer, parrots, beasts of prey, roses and wild men covered in fur, all lovingly rendered by artists who were just learning how to turn grooves in metal into pictures of the world. One can see why the Tobiases responded to these images: fear and fun are braided together, as are the pleasures and tedium of execution. The typewriter drawings included in the chapter look nothing like engravings, but the task of constructing figures from repeated Os, Xs and punctuation marks banged out on an old electric typewriter is similarly counterintuitive, and the hybrid creatures thus created have a demonic sparkle not unlike the bears and lions produced by the otherwise anonymous Master of the Playing Cards. Gert and Uwe Tobias, Chinoiserie I (2012), color woodcut on canvas, 200 x 300 cm, GUT 1881. ©VG Bild-Kunst, Bonn. Photo: ©Alistair Overbruck, Köln, courtesy cfa Berlin. 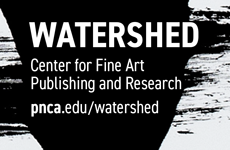 The second chapter focuses on a small group of chiaroscuro woodcuts (a technique that arose in the 16th century to imitate ink-and-wash drawings with a combination of line and tone blocks). It includes multiple impressions of Ugo da Carpi’s famous prints after Parmagianino—Diogenese, Saturn and Contest Between Apollo and Marsyas—as well as later imitations by the 18th-century collector of da Carpi and Parmagianino, Antonio Maria Zanetti. The Tobiases clip a number of motifs from the prints—a satyr’s leg, a plucked chicken—but discard their narrative drive and rational space. Instead they adopt the cartouche Zanetti created as the title page for his collected prints and drawings, and make this the primary structure for the book cover, announcement and a number of the woodcuts within. Zanetti’s device was meant as an ornament to language, which was meant to introduce the contents, which were to be seen as both individual artworks and as a collective testament to the connoisseurship of their owner. For the Tobiases, the device becomes the subject; they fill it with upside-down flowers or a faceted green teardrop (an allusion to a famous diamond, the Dresden Great Green). The sublime taste exhibited by Zanetti’s albums is the polar opposite of the chinoiserie etchings made at roughly the same time. In the 18th century, Dresden was the heart of Europe’s love affair with Asia. Augustus the Strong established the first European porcelain works, Meissen, in order to imitate the serene and hugely expensive Chinese ceramics he collected. These prints are Meissen’s rude, party-animal cousins. Produced in Holland and Germany, they understand “China” not as a place, but as permission to upend every rule of pictorial decorum: snakes fly, snails are the size of mopeds, rabbits have horns and birds have hooves. The garish colors and bizarre anatomies suggest a child let loose with a pack of highlighters while her older brother scribbles teats on everything. They were probably intended as cheap decorations to be cut up and glued to walls, furniture and boxes, an activity not unlike what the Tobias brothers did with their Surrealist-infused collages and woodcuts. The past, as Hartley said, is a foreign country, and the parallels between how 18th-century Europeans used China and how the Tobiases use the 18th century are clear enough. Left: Gert and Uwe Tobias, Great Green Dresden Diamond I (2012), color woodcut on canvas, 200 x 168 cm, GUT 1912. 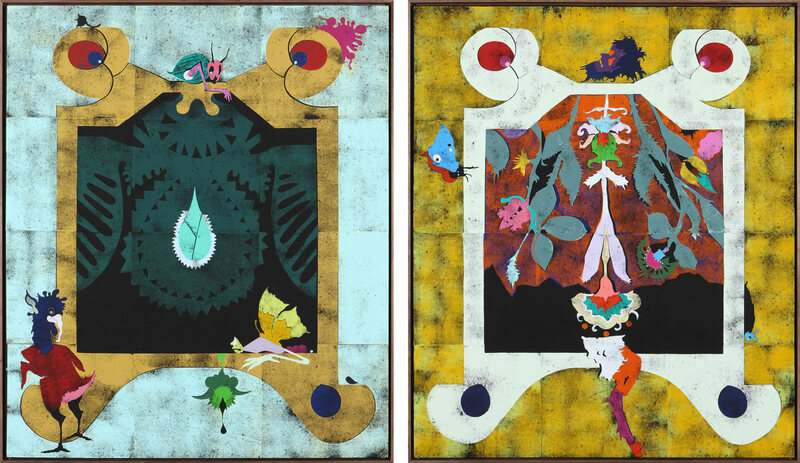 Right: Dresden Satyr I (2012), color woodcut on canvas, 200 x 168 cm, GUT 1914. ©Gert and Uwe Tobias / VG Bild-Kunst, Bonn. Photo: ©Alistair Overbruck, Köln, courtesy cfa Berlin. The last group, from the 1930s, contains the Tafelwerks of the constructivist Hermann Glöckner, simple panels of cardboard, covered on both sides with colored paper. These radical works anticipate Minimalist strategies by a quarter-century: form, material and subject matter are inseparable. But Glöckner’s works depart from the pedestrian materiality of Minimalism in one important way: several use silver and gold paper, suffusing their phenomenological presence with overtones of alchemy and high-church grandeur. The vocabulary of the three Tobias woodcuts here is starkly Modernist: black-primed canvas printed with an edge-to-edge grid that nods to both Agnes Martin and embroidery pattern books. But they follow Glöckner’s gilded example: in one, gold dots fill the grid like baubles in a Cornell box; in another, silver hovers behind the grid like a fog. 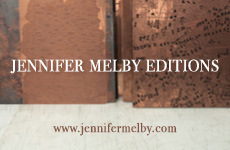 Though the metallic shimmer of the ink cannot be experienced in reproduction, Hering describes it as causing the woodcuts “to oscillate between glamour and minimalist asceticism.” We usually still think of Minimalism as a difficult movement, engendered by ideas rather than formal habits or personal preferences. The Tobiases expose its inherent decorativeness—a style put on or shrugged off as easily as any other. Obviously there is something superficial in their historical shopping spree: Glöckner and the Master of the Playing Cards lived in two quite different worlds and worked from quite different ambitions, as the essays make clear. By virtue of having survived into our own time, however, the objects they made have left those worlds and ambitions behind. We will make a 21st-century use of them, whatever it is. The art of the Tobias brothers is first and foremost stylish—not as in “fashionable” but as in English or Spanish: style is its language, its syntax and vocabulary. They are also great designers, and this can make the work seem facile. At their best, however, they build images that are simultaneously over-the-top, ironic and heartfelt—the visual equivalent of Dave Eggers’ prose. In this, they mirror the essential character of the Rococo. The mutant chicken should feel right at home.